We have arrived at the last sessions of the day where we focus on the ever-evolving area of immunotherapy! Here we summarize all the abstracts relating to the hot topic of chimeric antigen receptor (CAR)-T cell therapy. Preliminary data on the newest immunotherapeutic strategy—the bispecifc T-cell engagers (BiTEs)—is also reported. Initial results from the CAR T-cell construct bb21217—considered a “next-generation” anti-BCMA therapy because of its similarity to bb2121—was presented by Dr. Nina Shah of the University of California, San Francisco—from a Sunday session (ABSTRACT 488 https://ash.confex.com/ash/2018/webprogram/Paper116953.html). Twelve patients had been infused with the bb21217 construct and 83% of patients achieved a partial response or better. Cytokine release syndrome (CRS)—a common side effect of this treatment—occurred in 67% of patients. Neurotoxicity was also experienced by 25% of patients. Enrollment on this trial is ongoing. The CAR-T construct called LCAR-B38M—considered a “first-generation” CAR T-cell therapy was infused in 57 patients (ABSTRACT 955 https://ash.confex.com/ash/2018/webprogram/Paper110548.html). Treatment resulted in 88% of patients achieving a partial response or better. CRS occurred in 90% of patients (all mild). A trial has been initiated in the US. 20 patients were infused with a CAR T-cell therapy resulting in 85% achieving a response (ABSTRACT 956 https://ash.confex.com/ash/2018/webprogram/Paper112786.html). The CAR T cell construct CT053 resulted in responses in 100% of patients treated (17 patients enrolled on study) (ABSTRACT 960 https://ash.confex.com/ash/2018/webprogram/Paper113220.html). No neurotoxicity was observed. Dr. Sham Mailankody of Memorial Sloan Kettering Cancer Center conducted 2 trials using 2 different CAR T cell constructs (1) JCARH125, and (2) MCARH171. Forty-four patients received an infusion of JCARH125 which resulted in 82% of patients responding (ABSTRACT 957 https://ash.confex.com/ash/2018/webprogram/Paper113548.html). Eleven patients received the MCARH171 construct and 64% of patients responded (ABSTRACT 959 https://ash.confex.com/ash/2018/webprogram/Paper119717.html). In both studies, CRS was a common side effect as well as low blood counts. 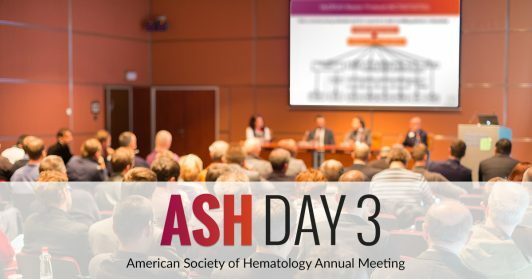 A small study from investigators in Seattle, Washington showed that their CAR T-cell construct resulted in all patients achieving a response to treatment (11 patients) (ABSTRACT 1011 https://ash.confex.com/ash/2018/webprogram/Paper117729.html). Another study of 23 patients infused with the P-BCMA-101 CAR T-cell construct resulted in 83% of patients responding (ABSTRACT 1012 https://ash.confex.com/ash/2018/webprogram/Paper111419.html). This therapy will continue clinical development. Ultimately, all BCMA-targeted CAR T-cell therapies result in high response rates. The differentiating features that will come to light with ongoing and future studies is how long responses last, the maximum number of cells that need to be infused, and whether some constructs are associated with less CRS and neurotoxicity than others. A small study used a construct that targets both BCMA and CD19 and the investigators from China infused it into 10 high-risk newly diagnosed myeloma patients (ABSTRACT 1009 https://ash.confex.com/ash/2018/webprogram/Paper117964.html). All patients responded to treatment and 60% of patients achieved minimal residual disease negativity. Another study developed a CAR T -cell construct that target multiple proteins on the surface of the myeloma cell (such as PRAME, SSX2, MAGEA4, NY-ESO-1, and Survivin). The multi-TAA construct was infused in 20 patients who were either in remission (8 patients) or who had relapsed (12 patients) (ABSTRACT 1014 https://ash.confex.com/ash/2018/webprogram/Paper113118.html). Two of the 12 relapsed patients responded and all patients who were in remission, only 1 patient has since relapsed. Interestingly, no patient experienced neurotoxicity. Other novel, targeted CAR constructs under development, but not yet in clinical trials include GPRC5D (ABSTRACT 589 https://ash.confex.com/ash/2018/webprogram/Paper110471.html) and the CAR-NK cell construct NKG2D which uses NK cells rather than T cells as the main immune cell to be reinfused in patients (ABSTRACT 590 https://ash.confex.com/ash/2018/webprogram/Paper114522.html). The next newest class of immunotherapy to come of age in myeloma treatment is the bispecific T-cell engager, or BiTE! BiTEs are like monoclonal antibodies but with two ends that can attach to cell surface molecules bringing 2 cells together. The first BiTE to be studied in myeloma is called AMG 420 and this BiTE can bind to the CD3 molecule on T cells and the BCMA molecule on myeloma cells. Bringing the myeloma cell and T cell together allows the T cell to kill the myeloma cell! Dr. Max Topp of Germany presented his phase 1 trial of AMG 420 in 42 relapsed myeloma patients (ABSTRACT 1010 https://ash.confex.com/ash/2018/webprogram/Paper109769.html). Dr. Topp showed that 70% of patients responded and that the therapy was associated with infections. This drug will continue its clinical development in 2019. There has never been a more exciting time for myeloma patients! Stay tuned for updates from the MMRF to hear more about our commitment to advancing next-generation immunotherapy approaches and making them more precise for every patient, while we continue to drive toward cures.